platformstation | An exciting & transient place, filled with the ramblings of an artist dreamer. An exciting & transient place, filled with the ramblings of an artist dreamer. So I haven’t forgotten my poor blog… I’ve just been absolutely swamped with the experience of art school and I haven’t know how to put it all into words. But, I finally have a small piece chipped out of the experience and formed into words. Sorry that it’s so short but it seems like an important piece. Other types of work I make I simply want to show because I think it’s cool or funny or clever and I hope others will enjoy it in the same way. Generally my thought is, “I hope they get the joke too, ect…” I have heard a lot of talk about whether it’s important to have your audience get your intent or understand your work. For me the answer is yes. Of course they are going to bring their own experience and references to the work but I hope my meaning and intention is in there too. If not, then why make the work and attempt to communicate? If it doesn’t matter what I’m saying then why even open my mouth, so to speak…? That’s how I feel about it and what makes sense to me currently. But I am becoming more comfortable with the idea that my intentions can mingle with other ideas and impressions from the audience. Interestingly the breakdown of the 2 approaches seems to be in my printing versus my performance art. And yes, I have started making performance art and I think I will stick with it. I found something there and it’s part of what’s going on that I haven’t had the energy or courage to tackle explaining what all is taking place. The prints tend to be the “how clever” stuff while the performances seem to be tailored to an audience or speak to a relationship I have with something or someone. This makes me think of a Relational Esthetics piece I did 2 years ago about engaging the “art shy” public of my home town in art making and dialog about art. Performance seems to be the marrying of this relationship building with expressing my thoughts and observations ect. So that is part of what I’m finding in art school. Eventually I will commit to “paper” more of the experience I’m having, but I don’t know when the timing will be right for that. I guess that wasn’t so short after all. A few image I took of my home town before leaving. I have one more week here and then I head off into the land of possibilities. I’m so excited for school and going down the rabbit hole that seems to be art school. I’m excited to be challenged and stimulated and find people who are smart and thinking about complex abstract art stuff; to find people on my level. I’ve never really tried to fulfill the potential of how smart I am, and it’s thrilling like a roller coaster; kind of scary in an exhilarating way. And I’ve never had this feeling about who and what I may become if I pursue this… I don’t know how to describe the feeling other than I’m kind of wide-eyed at how much potential and possibility I’m seeing within myself… There is just this childlike awe and excitement about becoming. I don’t know if that makes any sense but it’s pretty cool. And I hope it’s not false, but if it is, I’ll deal with that as it comes. Whatever this is, or however it turns out, it’s good I think. It’s a relief to feel something different and new, and I think I’m headed in “the right direction” whatever the hell that means. 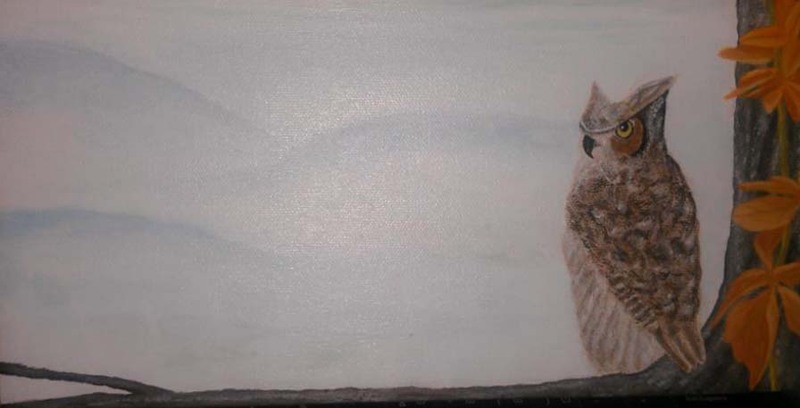 Owl in late Fall, for my mother. 6″ x 12″ Acrylic on canvas. I am currently going through an interesting transition but it feels rote and boring to go through all the small details. I have submitted my application to art school and I am waiting to hear back. I intend to move to the city where this school is whichever way the application turns out. I am ready for a change and I am ready for a thriving art community. I am currently under stimulated in general but majorly so in my art practice. This is due to the fact that I am leaving and thus not investing in anything here; this has been a theme for months. So, I have been painting (which should tell you how desperate I am. Painting really isn’t my thing; I am so not a painter) but I have been enjoying it and feeling some of the outlet I’m seeking. I am typically a print maker or drawer. I haven’t had access to a printing press for 5 months and I keep asking myself, “What happens in this situation?” Do all print makers huddle around universities studios and become teachers or professional students? Do we all go into debt purchasing our individual presses, because boy, that seems like a waist; a good press can be shared by many people easily, if it is used respectfully and gently. I need to look into this further. It’s been an interesting posture to work from, when considering what it means for the work and how it changes my dialog with myself and the piece. I would love to hear other artists’ thoughts about making work as gifts. Would be interesting. The 99% & The 1% Could Get Along… Or At Least Help Each Other. So today I’ve been reading articles about money and earnings and wealth, or the lack of it, and I think I’ve figured out how to fix everything…. No, seriously. This is what I keep reading over and over: You guys earn too much and then pretend you’re not very rich by spending it all. And you guys keep pretending you’re poor by not going out and earning more money. I also like cracked.com’s articles about the reality of how hard things are to achieve or gain, and how we have disproportional expectations most of the time. So, what I think we should do: we should coordinate, on a massive scale, classes of the rich and poor to teach each other. The rich would teach the poor how to make more money, more effectively, and share their expertise around efficiency and decision making savvy ect (the things that put them on/near the top). In turn, the poor would teach the rich how to budget, live more frugally, and live with less. This should free up time for both groups and hopefully create community members. I’m thinking at least 2 service commitments (some type of volunteering) a month. This just makes for good people and lessens the general douchbaggery of all people. This is not actually a fix-all but a plan, among many things, that would help to lessen the gaps between rich and poor. Also, along with basic skills and mentorship, this will also develop compassion and understanding and create real relationships, which seems like half the problem when you read about the issues. It’s well documented that equality is directly proportional to the ability to dehumanize the outside group. In the end the success of the mentie becomes the success of the mentor. There would always be encouragement to reinvest in the program and help other folks who were struggling, even after a participants initial success. It would become wealth with a mission. MLK Day & Our Own Selfishness. Feeling kind of sad this morning. Recently it became apparent again that I can only really take one thing at a time and often the thing “to do” is find acceptance. In one way this is extremely freeing, and in another, this feels a bit out of control. But that’s the funny part. These things are outside of my control and I’m only in control of me and my choices and responses. Any other sense of control is just an illusion, and I know that. I’m feeling my world get smaller (neither positive nor negative) and in turn it feels like myself and my inner world is strengthening again (absolutely positive). 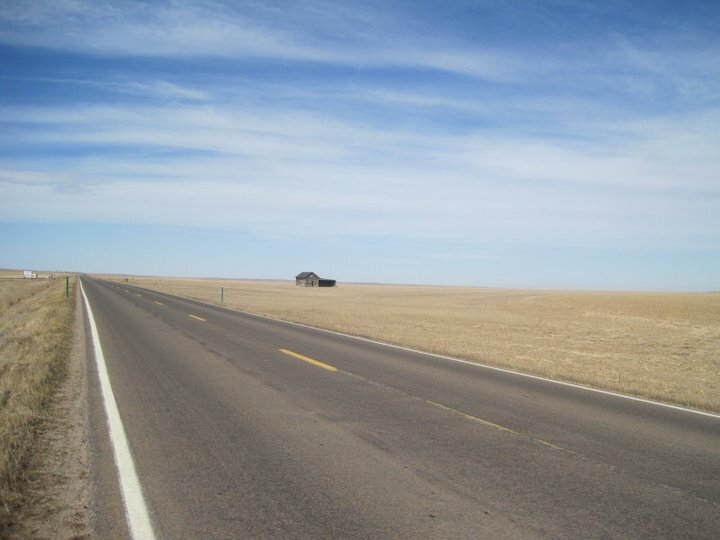 County road in Northeastern Colorado about to cross into Nebraska. I also would just like to point out that my trip did work out; the details just ended up being different than anticipated. I met some interesting people and spent time in the midwest absorbing the land and its people and culture. I left home with the hopes of slowing down and being with myself to sort out somethings I was feeling. I was emotionally constipated with anger and I hadn’t said hello to myself in so long that I wasn’t even sure I was still there. I wanted to get re-acquainted and not feel like I was at war with the world or with myself. I guess my road trip was a meeting at Camp David, between me, my feelings, and the hurt of resent events. The point was to make peace. Not to resolve everything into tidy little categories and boxes, but to make peace (stop wagging war on myself, my feelings, and the things that happened) and get on the same side to work towards a resolution. To make a break in the dialog and change course. To stop being so damn angry and to make peace. This was the point of my trip and was the success of my trip. The details in-between leaving and coming home were pretty superfluous in that. (Including the RV dying.) Driving around the midwest, with a very loose itinerary, looking for a Huck Finn type summer worked out wonderfully. I knew I wouldn’t be board but I wouldn’t be distracted either and it gave me enough room to find some peace with in me along the way. Platform Station… What’s with the name?